Ash Wednesday is coming up on March 6, which marks the beginning of the season of Lent. Lent is the time on the church calendar during which we prepare ourselves, through spiritual disciplines such as fasting, prayer, and service, to come close to the mystery of Easter. Lent is a serious time, which can make it difficult to consider how we should engage our children and families in meaningful ways this season. Lent can be a wonderful season for beginning, continuing, or getting back on track with rhythms of family discipleship in your home. Remember, this is a time to make space by subtraction, not a time to schedule yourselves up so much or to commit to so many spiritual experiences that you overwhelm yourself and your family. We have created a simple Lenten calendar that will walk you through the season giving you one thing each day that is designed to direct your heart to Jesus through fasting, prayer, or service. The calendar also includes the daily Psalms readings that our church is doing together--as Lent is an excellent time to lean into the Psalms--a book that pours out all human experience before a loving savior who is both the Lamb and the Good Shepherd. We’ve also put together a prayer liturgy based on the Psalms that your household can use on a weekly basis to observe this season together. Below, you will find a list of supplemental resources, and further explanations for some of the activities listed on the Lenten Calendar. Again, approach this list with prayer and discernment. We pray that whatever you choose to do, or not do, you will do it in joy and in freedom that the purpose of our fasting and our praying and our giving is to feel the ache of our brokenness, our deep need for a Savior and to lift our eyes to his beautiful face. 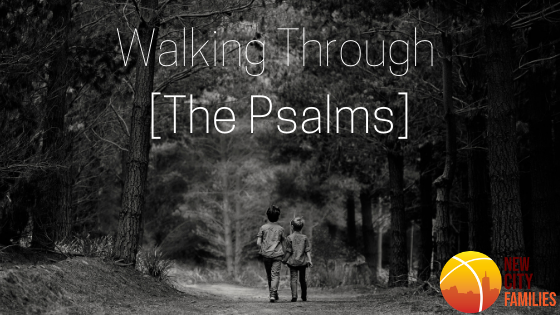 Family Worship: We've created a Lenten Liturgy based on the Psalms that you can download here. There are a few materials you will need to gather from around your home or the store, so you may want to look at it ahead of time. Our family plans to use it on Saturday evenings during Lent. If you use it, please take a minute to share how your family is using it on our New City Families Facebook page. Burying the Alleluia: This hands-on activity can help children understand Lent as a time to mourn and repent of our sin. Make Alleluia banners– these can be as simple as markers or watercolors on large pieces of paper or as complicated as fabric banners sewn together– the important thing is that this activity can be done together and can provide an opportunity to talk about alleluia– what it means and why we say it. Together, either on the last Sunday before Ash Wednesday or on Shrove Tuesday, bury the Alleluia banner, either in a box outside or in a closet in your house, in your basement, etc. Then on Easter morning, get it back out and display it in your house throughout the Easter season. The third spiritual discipline observed during Lent is giving. It can be beneficial to focus on a specific group of people or ministry for the entire season, to learn about them and to commit to pray for them. Some examples include: refugees, the unborn, children in poverty, people in the 10/40 window, orphans, foster children, etc. There are many tangible things that your family could do in addition to monetary donation during Lent to support ministries and organizations that are dedicated to these populations and bountiful resources online to help your family learn about them and pray for them.